Dirndl velvet ribbon necklace with heart pendant. The alternative young necklace to the dirndl. A matching necklace for a dirndl turns a dirndl into the perfect dirndl. The trend towards the complete authentic outfit remains and so this necklace is simply a must for any dirndl, as it creates a nice neckline. 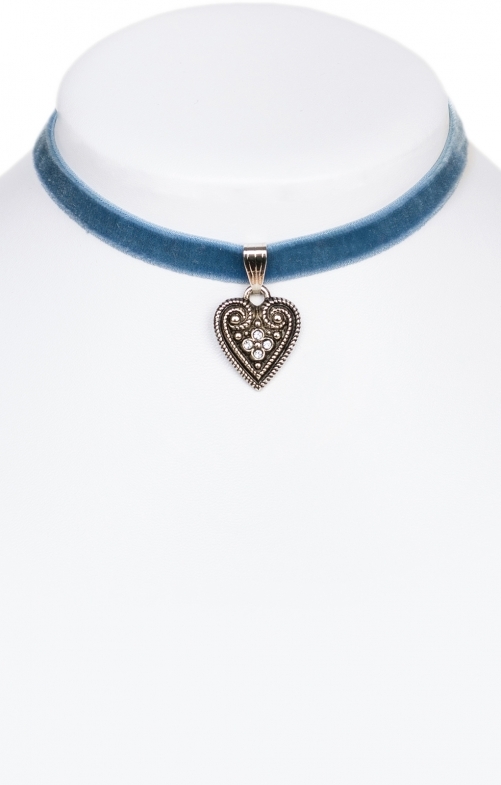 While in normal necklaces, the colours are usually in the pendant of the chain and thus inconspicuous, the light blue velvet ribbon chain matches directly to the dirndl colour. Worn close to the neck, this looks young and fresh and the small heart pendant with the colour-matching rhinestones is a traditional element and a great eye-catcher at the same time.